September 10th is the Jewish New Year, Rosh Hashanah, a day in which Jewish families around the world ring in the year 5779. Whether your child or classroom is learning Hebrew or not, it's a great time to expose them them to Jewish culture and global traditions surrounding this important Jewish holiday. Rosh Hashanah translates from Hebrew to mean "start of the year." Traditionally, Jewish families attend services in a synagogue and enjoy traditional holiday meals with family on this day and the next. The central observance of Rosh Hashanah is the sounding of the shofar, the ram's horn, which is sounded on both days of Rosh Hashanah to mark the start of the new year. For a fun craft, your child can make his or her very own (thankfully less noisy) cardboard shofar here. Many of the foods Jewish families eat during this holiday are also symbolic. 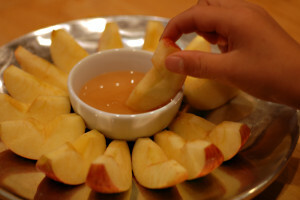 For example, apples dipped into honey help prepare followers for a "sweet" new year. And Challah, a round loaf of egg bread is also commonly eaten on the first night and symbolizes the circle of life. Apples & honey are traditionally eaten by Jewish families on Rosh Hashanah to symbolize a "sweet" new year ahead. Teach your child about this yummy tradition by whipping up a batch of Honey Apple Cupcakes together. If you want your children to learn more about Jewish tradition and learn Hebrew, check out our award-winning Hebrew for kids program. Are you celebrating the holiday this year or teaching your child Hebrew? Be sure to send us your pictures or share them on our Facebook page. And don't forget you can get Rosh Hashanah cards here to wish your Jewish friends or family members a happy new year! The traditional greeting is "shana tova," which translates to "good year." It's the time of year for family, friends, and tradition. In the Jewish community, Hanukkah (Chanukah, or Channukkah) is known as the "Festival of Lights." It is an eight-day festival celebrated in November or December, commemorating the miracle of oil that occurred in the Holy Temple during the Maccabean Revolt in the 2nd century BC. This year, it begins on December 24th and ends on January 1st. Today, it is celebrated by Jews around the world and is filled with food, family, and presents. What a wonderful opportunity to teach your children about Jewish history, engage in meaningful crafts, and even teach them a little bit of Hebrew! Here are a couple of fun, meaningful activities to do with your children this Hanukkah! "Hanukkah Sameach,” and "Chag Sameach," mean "Happy Hanukkah." However, "Chag Sameach," is closer in meaning to "Happy Holidays." If you really want to impress, say "Chag Urim Sameach!” (urim means “lights”, so this phrase means "Happy Lights Holiday" or "Happy Light Festival"). Now that you know, let's go! Teach your children the story behind Hanukkah, along with the basics of driedel play, with this interesting history. The video below is an excellent animation for kids depicting the struggle of Jews to maintain their way of life during a time of persecution; explaining the miracle of oil and how driedel play helped protect Jewish families during raids. Driedel, Driedel, Driedel, a Driedel Picture Frame! After learning about the history of the driedel, lead your little ones in a craft that allows them make their own foam driedel in the form of a picture frame! This easy craft, adapted from one at Activity Village, includes a personal photo and allows kids to spell out whatever message they like. It will be a precious memory for, too, for many years to come! Cut a driedel shape out of the white foam that is big enough for your photo to sit on top of without overhang. Cut a blue rectangle that fits underneath the photo. Cut a small "picture frame" out of the blue foam that will sit over the picture. Glue back of photo to the blue backing. Glue or stick the top frame to the photo. Place photo and backing on the driedel cut-out, sticking it to the foam with either the sticky backing or glue. Help child spell out their message with the foam letters beneath the picture. Stick letters to the foam. Make a small hole and thread ribbon or an ornament hanger through the hole, if desired. Can't wait for Hanukkah to roll around? Want your little one to impress the relatives at the family meal? At Little Pim, we've got you covered with a full Hebrew immersion program geared toward your little ones. December 24th is coming soon, so contact us today!